Seen from left to right : Dr. Shivakumar M, Principal, GSSSIETW, Sri. R.K. Bharath CEO & Board member, GSSS(R), Sri. Veerappaji B. Shivanna, Campus Recruitment Lead-India, Mindtree, Bengaluru, Sri. Srinivas Gupta Vice President GSSS(R), Dr. M. Jagannath Shenoi, President. GSSS(R), Smt. Vanaja B Pandit, Hon. Secretary, GSSS(R), Sri. Sanjay Srinivasmurthy, SVP & Director, Silicon RD Ideation Labs, Mysuru, Smt. Ratnamma Kenche Gowda, Member GSSS(R), Sri Ashok Shenoi, Member, GSSS(R), Smt. Anupama B Pandit, Administrative Officer, GSSSIETW and Sri B.K. Nataraj, Member, GSSS(R). First year students along with parents during the inagural function. Felicitation to Kum. Tejaswini HV, VTU 8th Rank holder of Instrumentation & Technology (2013-17 Batch). Felicitation to Smt. Venkateshwaramma B, VTU 1st Rank holder & Gold medalist in M.Tech. Digital communication and Networking ( 2015-17 Batch). 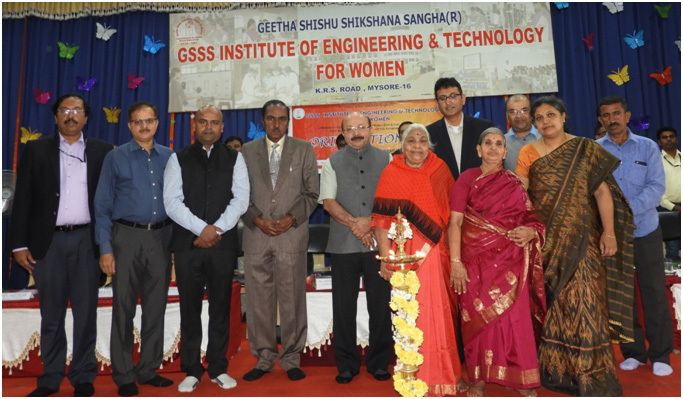 GSSS Institute of Engineering and Technology for Women, Mysuru, organized the Inaugural Function of First year B.E. classes for the academic year 2018-19 on 13th August 2018, Monday at 10 a.m. Sri. Veerappaji B. Shivanna, Campus Recruitment Lead-India, Mindtree, Bengaluru was the Chief Guest for the inaugural function. In his inaugural address he emphasized the students to set solid goals and objectives to become good engineers and suggested them to inculcate engineering attitude. He advised students to have a positive attitude, develop skills and spirit in acquiring the knowledge to face the competitive world and also wished all the first year students a bright future. Sri. Sanjay Srinivasmurthy, SVP & Director, Silicon RD Ideation Lab, Mysuru was the Guest of Honour. In his speech he advised students to develop scientific spirit in life. He suggested to develop problem solving skills to become good engineers. He emphasized to keep their dreams alive and choose the right way of life. On this occasion the College Magazine ‘GEETHA VAIBHAVA 2018’ was released by the dignitaries. The dignitaries honored VTU 8th rank holder Kum. Tejaswini HV of B.E in Instrumentation & Technology (2013-17 Batch), VTU 1st Rank holder and Gold medalist Smt. Venkateshwaramma B of M.Tech Digital Communication and Networking (2015-17 Batch) with Rs. 10,000 cash prize and Certificate of Appreciation. The function was presided by Dr. M. Jagannath Shenoi, President, GSSS(R), Mysuru, Smt. Vanaja B Pandit, Honorary Secretary, GSSS(R), Mysuru, Sri Srinivas Gupta, Vice President, GSSS(R) , Sri R.K. Bharath, CEO and member, GSSS(R), Smt Anupama B. Pandit Administrative Officer, GSSSIETW, Management Committee Members of GSSS(R), Smt. Rathnamma Kenche Gowda, Sri Ashok Shenoi, Sri B.K. Nataraj, and Principal Dr. Shivakumar M, Heads of the Departments of all branches and Faculty members were present on the occasion.